...it seems people like money more. Have too many skulls, people might think you are nuts. You ask me, the same should be true about money. One of the most valuable things on earth is a good sense of humor though -- and that's something money can't buy. Absurdity is the recognition and celebration that some things just don't make sense, and it's best when done with a sense of humor. 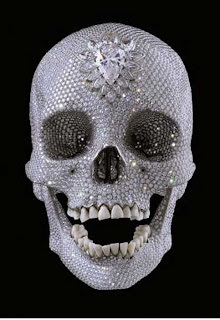 To cover a skull in $98,000,000 of diamonds (and ideas -- they cost $28,000,000 without the idea...) is nothing short of absolute absurdity. It's kind of the wonderfully silly thing that no one should ever do, and we are so happy that some did. There 8601 diamonds on it if you are counting. Thank you Damien Hirst (and thank you Jim for reminding us of this shiny sparkling brainbox). Damien is the same guy who did the shark at The Met, by the way. 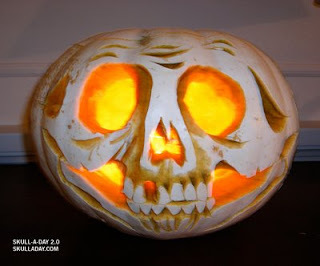 I don't know why but kids and grown-ups all find skulls cool. Would Rock & Roll have been invented without skull images? What about pirates? Would we remember them if their flag had been lollipops or squirrels? Who figured out that skulls were cool? What makes them cool? There are a lot of questions people can't answer, that's for sure. 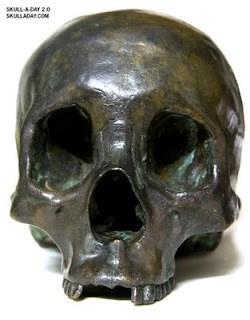 But if you need skulls in your daily vision-diet, this website will deliver them, one a day, every day.